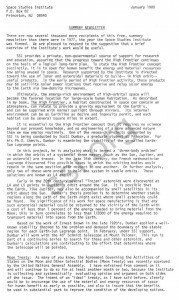 There are now several thousand more recipients of this free, summary newsletter than there were in 1977, the year the Space Studies Institute was formed. We are pleased to respond to the suggestion that a brief overview of the Institute’s work would be useful. SSI provides a private, non-governmental source of support for research and education, assuring that the progress toward the High Frontier continues on the basis of a logical long-term plan. To state the High Frontier concept succinctly, it is to open for human benefit the energy and material resources now going unused in space. Research supported by the Institute is directed toward the use of lunar and asteroidal materials to build–in hiqh orbit-­useful products. 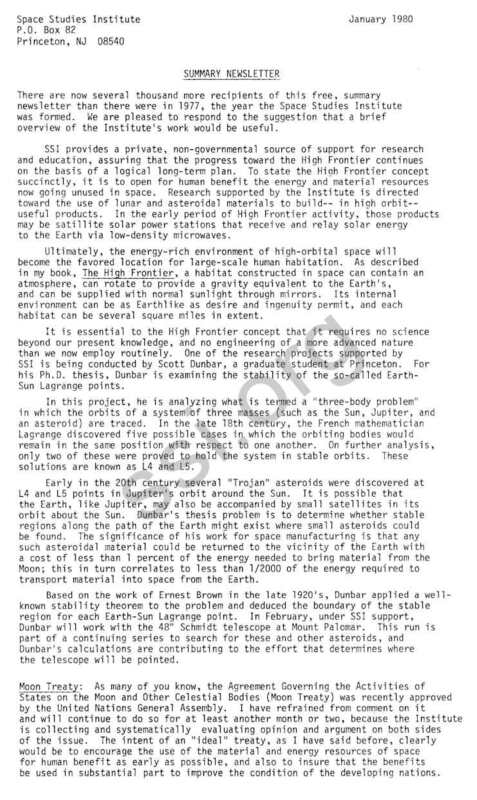 In the early period of High Frontier activity, those products may be satillite solar power stations that receive and relay solar energy to the Earth via low-density microwaves. Ultimately, the energy-rich environment of high-orbital space will become the favored location for large-scale human habitation. As described in my book, The High Frontier, a habitat constructed in space can contain an atmosphere, can rotate to provide a gravity equivalent to the Earth’s, and can be supplied with normal sunlight through mirrors. Its internal environment can be as Earthlike as desire and ingenuity permit, and each habitat can be several square miles in extent. It is essential to the High Frontier concept that it requires no science beyond our present knowledge, and no engineering of a more advanced nature than we now employ routinely. One of the research projects supported by SSI is being conducted by Scott Dunbar, a graduate student at Princeton. For his Ph.D. thesis, Dunbar is examining the stability of the so-called Earth­Sun Lagrange points. In this project, he is analyzing what is termed a “three-body problem” in which the orbits of a system of three masses (such as the Sun, Jupiter, and an asteroid) are traced. In the late 18th century, the French mathematician Lagrange discovered five possible cases in which the orbiting bodies would remain in the same position with respect to one another. On further analysis, only two of these were proved to hold the system in stable orbits. These solutions are known as L4 and L5. Early in the 20th century several “Trojan” asteroids were discovered at L4 and L5 points in Jupiter’s orbit around the Sun. It is possible that the Earth, like Jupiter, may also be accompanied by small satellites in its orbit about the Sun. Dunbar’s thesis problem is to determine whether stable regions along the path of the Earth might exist where small asteroids could be found. The significance of his work for space manufacturing is that any such asteroidal material could be returned to the vicinity of the Earth with a cost of less than 1 percent of the energy needed to bring material from the Moon; this in turn correlates to less than 1/2000 of the energy required to transport material into space from the Earth. Based on the work of Ernest Brown in the late 1920’s, Dunbar applied a well­ known stability theorem to the problem and deduced the boundary of the stable region for each Earth-Sun Lagrange point. In February, under SSI support, Dunbar will work with the 48″ Schmidt telescope at Mount Palomar. This run is part of a continuing series to search for these and other asteroids, and Dunbar’s calculations are contributing to the effort that determines where the telescope will be pointed. As many of you know, the Agreement Governing the Activities of States on the Moon and Other Celestial Bodies (Moon Treaty) was recently approved by the United Nations General Assembly. I have refrained from com~ent on it and will continue to do so for at least another month or two, because the Institute is collecting and systematically evaluating opinion and argument on both sides of the issue. The intent of an “ideal” treaty, as I have said before, clearly would be to encourage the use of the material and energy resources of space for human benefit as early as possible, and also to insure that the benefits be used in substantial part to improve the condition of the developing nations. My trip to Vienna has been rescheduled for the week of February 18. The Japanese visit has been tentatively scheduled for March 20-30.